We all have experienced it. A dear or favorite book is made into a movie. A classic book we read has a classic movie to go with it. A movie we see intrigues us enough to make us read the book it is based upon. Or, a book you always wanted to read has a movie based on it coming out. Life of Pi fell under that last category for me. Yet other books called, time is never enough. Then the film buzz started and the pressure built, so I found the spare moments in the early dawn, at lunch, where there weren’t any spare seconds, to read it through before the movie came out. Deadlines are good. The thing with good books is they are full of inner life. Lots of tell, not that much show. One of my favorite books is Under the Volcano, by Malcolm Lowry. A richness of character and meaning, imagery and subtlety, life and death are parsed down through simple ink on paper. How can this be made into a movie? It was made into a movie (Under the Volcano, 1984) , directed by John Huston, no less. Albert Finney was nominated to an Oscar for his role as the alcoholic British ex-Consul living in a backwater Mexican town with great dreams and plans, all brought down by his alcoholism. A story told in one fateful Day of the Dead in the shadows of the Popo. But I did like the book so much better. There are books that are more cinematographic. You might even think that the writer was thinking “movie” as the words were being typed or scribbled. While I’m sure it would be disputed to the death by many a writer, the obvious influence of cinema is pervasive in more contemporary books, if not really in the intent of the writer’s mind. Movies based on those books can in fact be as good or much better than the original source. The books of Stephen King or J.K. Rowling come to mind. I like both authors, and I have read tons of King and all of Harry Potter. It can be a conflict, though, to decide what is better: The Shining the book, or The Shining (1980) the movie–they in fact are so different. The Harry Potter series or the the Harry Potter movies. Again, each a different experience. These and others have the characteristic that a different medium shows the lives of the characters differently. But, as you read, these books are so full of imagery that an inside-your-head movie conveying the action packed lives of its characters can be visualized clearly, much more so than their own inner lives. It is when the writer overdoes it that the book falters. The Silence of the Lambs (1991) was a great movie based on Thomas Harris’ well written novel. I did not like Hannibal, the book he wrote after the success of Lambs. It read too much as an extended movie treatment. Peter Benchley’s Jaws was a book to read; Jaws (1975), the movie, I can watch over and over again. In all good conscience, I cannot say the same for The Deep (1977). Sometimes a movie is perhaps so unique an experience that you may be intrigued by its book. The Descendants (2011) was an extraordinary experience, yet I must confess I have not read the book by Kaui Hart Hemmings. It is on my list. (Full disclosure: I had read the script for The Descendants before I saw the movie, so I knew what I was going into. Or so I thought.) This is something I did not want to happen to me with Life of Pi. Yes, and then there is Life of Pi (2012). The story of a spiritual boy named after an irrational number stranded on a small boat in the middle of the ocean with a savage beast named after a practical, down to earth hunter. So much had been said about how a movie could not be made from this book, that I puzzled as I read it. It is so full of vivid imagery, so descriptive. As I kept on reading, though, its true wonderment sifted through the words. A tale of two opposites, the believer and the non-believer; the rational and the irrational; the real story and the better story. A reason to be spiritual, to believe in god. That is quite a theme. Hard to make a movie out of that. Not to mention the logistics of realistically filming a sixteen year old boy in the middle of the ocean, sharing a small boat with a full grown Bengal tiger. I spoke above about the fact that The Shining, Stanley Kubrick’s film is different than The Shining, Stephen King’s book. The film is great cinema based on a book. Its use of color, the effects, its conception almost overwhelms the underlying story. In the movie, Red Rum is all over, the plot twists are there as are the characters, the story is there, but… Kubrick crafted with his imagination, tools and technology a movie that conveyed the sense of story in film. He made films. If you actually want to see the story there is a miniseries, executive produced by Stephen King, that is more faithful to the book. I prefer Kubrick’s movie. 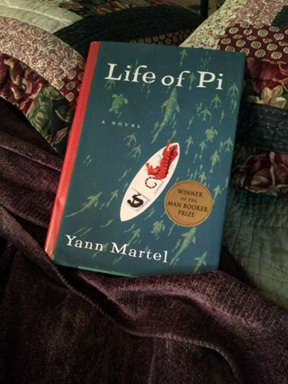 With Life of Pi, Ang Lee conveys masterfully the sense of story from Yann Martell’s book. The book itself takes a while to put us out at sea, 36 short chapters out of a deliberate 100. In that book’s first third, the dialogue between the profane and the divine is set up in a way the movie does not–lots of tell, not show. I do miss from the movie those prolonged contrasts and discussions: Mr Kumar, the holy Muslim baker, and Mr Kumar, the atheist schoolteacher. The distinction between believing in god and believing in religion. The scorn towards agnostics. Wild beasts hiding in metropolis. The zoo vs. the circus. But all those things make the book, the book. Martell calls the freighter the Patels board to set out to the new world Tsimtsum. Tsimtsum is a cabalistic term related to the origin of the universe. Before the beginning, God’s presence fills all. At Tsimtsum, God contracts creating space for the universe to exist. Once the freighter Tsimtsum sinks (with a monstrous metallic burp, Martell writes, in a throwback reference to Krishna’s mouth), a new universe for Pi is created. A true new world in which he decides to survive against all odds, and in which the spirit must control the animal in order to do so. Heady stuff, structured and narrated well in the book’s ability to speak the inner life, but difficult to tackle in the visual medium of film. That is where technology steps in. The use by Ang Lee of CGI and 3D to reveal the spirituality in the story is akin to Kubrick’s use of technologies at his disposal to pull us into the haunted horror of a snowbound hotel in Colorado. 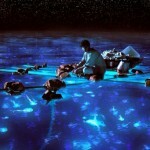 Life of Pi is definitely the best use of 3D technology so far to support the story narrated by the film. Major differences in the film are required to edit backstory and exposition. The film introduces a character, a young love interest for Pi, to personalize figuratively what he leaves behind when he boards the doomed freighter . The cook, hardly mentioned in passing in the book at the beginning, is brought to life (and played well by Gérard Depardieu) to highlight different cultures and customs. To support Martell’s argument that to survive in a reductionist universe the beast needs the spiritual and viceversa, the film adds a sequence in which Richard Parker jumps off the boat and, towards the end, there is actual physical contact between Pi and Parker. Neither scenes were in the book but, in the movie, make the point of the book. Lee’s Sense and Sensibility, The Ice Storm, Brokeback Mountain, are all masterpieces of character study and revelation. Life of Pi is one in which spiritual revelation trumps character revelation. 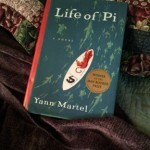 In the end, Pi remains a mystery, yet the story’s intention does not. The film successfully translates into the visual words on a page about a long fantastic story that is lofty and spiritual contrasted to a short credible story that is practical and mundane. And, just as in the book, it asks you to choose the better story.